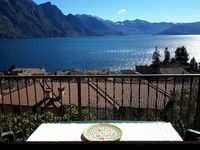 Property 52: Beautiful and nicely furnished apartment with view of Lake Iseo. Property 63: In a green and relaxing atmosphere, with pool and stunning lake view. APARTMENT "THE VALLEY OF THE SIGNS"
Property 69: APARTMENT "THE VALLEY OF THE SIGNS"
Property 78: Family friendly villa with swimming pool, immersed in the greenery and with breathless view. Apartment in duplex villa, garden with gazebo, close to all facilities. Property 93: Apartment in duplex villa, garden with gazebo, close to all facilities. Villa with beautiful lake view surrounded by olive groves. Property 100: Villa with beautiful lake view surrounded by olive groves. Riva di solto is a medieval village, nicely kept with flower boxes and residents out sweeping the streets; quiet; centuries of history The pictures of the apartment don't do justice to this location - its lakefront and if a storm comes over the lake and mountains there is front row view of lightening and rain. It also looks over the piazza to see the ducks and birds picking up snacks from the tables along the waterfront This apartment has been beautifully restored with high end bathrooms and well equipped kitchen. The beds are very new and comfortable. There is a little market within feet, a short walk to restaurants or gelato, and plenty of nearby parking. The ferry landing is very close by. Our plane was very late and we arrived at 3am to a smiling a gracious hostess who offered us coffee If you want noise, crowds, other tourists, this isnt the place for you After Lake Iseo we went to Lake Como and the scenery is similar but the pace in Lake Iseo is calmer and the languages heard are less English There were three of us staying in the apartment, and there was plenty of room for all; easily four people could spread out here. One of the best meals I've had in Italy, down the road at Zu, features lake fish. We had travelled to Lago d'Iseo for the Cristo &quot;Piers Project&quot;. This apartment overlooks lake, could actually see part of the project from the expansive terrace. Riva di Solti is a most charming village, without pretense and none of the tourist stuff that mars so many locations. The people are just so friendly, everyone greets everyone and after two days it is as if you lived there forever. The market, butcher shop, and restaurant were so nice (the restaurant, Il Hilton, is managed by Gregario and he makes the most superb wild boar with tagliatelli, you must try it!). The pictures do not do justice to the listing, it is quiet, with a just wonderful terrace. Now, it is 200 meters from the promenade on the lakeside with all the stores. However, those 200 meters include 161 steps (I counted). If you have mobility issues and do not have a car, this would not be a good selection. We didn't have mobility issues, and didn't have a car, and enjoyed walk through village each day. The best part of this listing of course is Flavia. She is so helpful, welcoming, and just genuinely nice. Knowing we did not have a car, (we travelled by bus, train and ferry), she arranged to pick us up at ferry, and then when we left she gave us a lift to the nearest bus stop to go to bergamo. She was just a delight. Wonderful rental, she could have charged 2x more and we would still have found it a bargain!